#1 Real Estate Book for Today’s Market The Digital Home Seller & Online Real Estate Trends provides the most current and relevant material to enable anyone to sell their home while avoiding traditional real estate commission fees. What it does not include is any misguided information and it won’t point you to resources and outdated methods from the 1990s (think handbooks and FSBO kits) that amazingly continue to still be used today. Eric Eckardt, an industry veteran, believes that homeowners should be empowered to sell their own homes successfully and preserve their equity in the process. 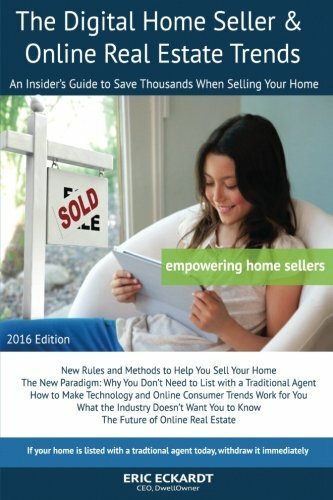 Using the proven techniques and methods in this book, home sellers will be able to leverage the newest online consumer trends and digital resources to maximize the home selling process. What you will learn from this book: • New Rules and Methods to Help You Sell Your Home • The New Paradigm: Why You Don’t Need to List with a Traditional Agent • How to Make Technology and Online Consumer Trends Work For You • What the Real Estate Industry Doesn’t Want You to Know • The Future of Online Real Estate The digital home seller movement is spreading across the U.S. with a mission to eliminate the $60 billion in inflated, unnecessary commission fees that the real estate brokerage industry takes in from consumers. There has never been a better time to sell your own home, and this book will guide you on how to do so in the most efficient and effective way possible while learning about industry trends, market dynamics and the future of online real estate.